At Sport Medics we understand the importance of having accredited continuing education courses. 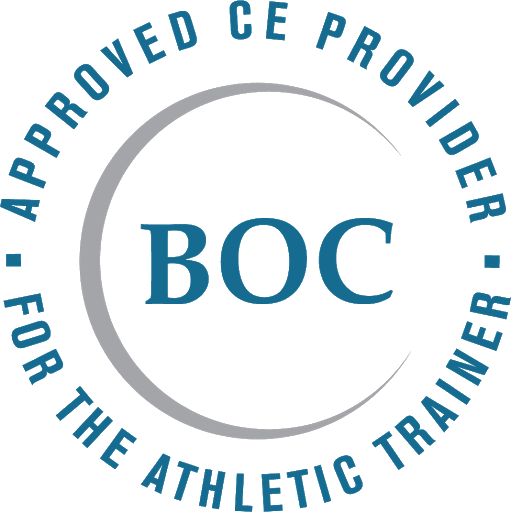 We are currently approved by the NATA BOC and and we are working closely with all other licensing organizations of our professionals to have our courses reviewed and approved. See below to view the current status for each organization. While we will do everything we can to have our courses approved, and provide that information to you, it is the personal responsibility of each professional to understand the continuing education requirements of their licensing agency. Many organizations allow their professionals to complete unaccredited courses, but may require additional supporting documentation or limit the number of unaccredited units that their professionals can submit in a given reporting period. Please take the time to carefully review and understand the requirements of your specific professional organization. We are proud to say that we have achieved Approved Provider status for the National Athletic Trainer's Association as of December, 2008. Approved courses can be reported under Category A (up to 75 units per reporting period). The specific approval status of each course and the unit value assigned can be viewed on the Course Info page accessed from the Course Catalog. Approved courses have their own unique approval number, which will be located on the certificate of completion. For courses that are not yet approved, they can be reported under Category D (up to 20 units per reporting period). We are working diligently to have all of our courses approved and will update our catalog daily. Physical Therapy Continuing Education requirements vary significantly by state. Be sure to understand your state's approval process and renewal requirements. We are currently seeking accreditation from each state that requires it for all of our sports medicine and rehabilitation courses. For the specific approval status of each course, check the Course Info page accessed from the Course Catalog. You can click here to access the contact information for all state physical therapy licensing agencies to investigate your specific state requirements.